One of the most popular home designs nowadays is modern country. Known for its simple, charming, and farmhouse-style look, this unique design combination is fast become a popular interior design style. Natural materials such as wood are a key feature of the modern country home design. They’re timeless and they give the house a rustic and cozy look. 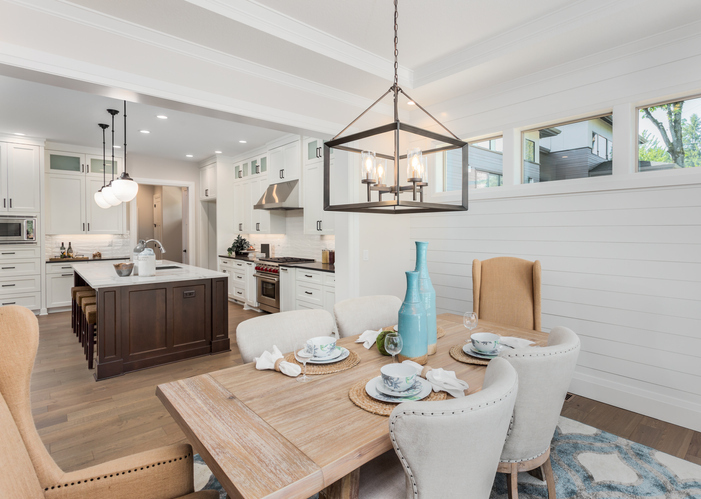 Wood is best used as a dining table, a barn door, floorboards, paneling or exposed beams. Stone is also a popular natural material that you’ll see in a modern country home, often found on the same wall as the home’s fireplace. Patterns are a very distinct characteristic of a modern country home. These give a home more personality and make certain spaces stand out. So don’t be afraid to use different patterns, whether they’re stripes, floral, or even geometric. When playing around with patterns, make sure to place these against a simple background for the patterns to stand out. It’s also best to use one pattern per room. For a more cohesive look, take the main color of a busy piece and pair it with another home piece with a simpler pattern. For more depth and texture, add rugs, blankets, and throw pillows in your home. You can even add natural rugs made out of wool, sisal, or hemp. To evoke a laidback and cozy feeling, make use of natural hues and wooden tones such as white, brown, beige, and cream. These particular colors show off true country charm by drawing inspiration from nature. Just make sure that you choose the colors that you are drawn to naturally so you won’t get tired of them. A modern country home design often has unique pieces of furniture placed throughout the home. These pieces can be made of anything, such as old glassware, handmade items, mismatched handles, and the like. These kinds of knickknacks are typically repurposed, secondhand, or found in flea markets. Also, they add a touch of character to the home. Light is an important element in a modern country home. To bring in more light, hang mirrors and decorate your home with lighter colors. Make use of minimal window treatments and rearrange any furniture that’s blocking the doors and windows. These will instantly make your home look brighter and more spacious. At the end of the day, a modern country home design is all about simplicity. Rarely will you find anything sleek, shiny or opulent in this kind of home style. A great modern country home design is one that is chic, warm, and simple. A home with this style becomes a cozy yet stylish place to live in. Looking for a modern country home in South Texas? Desert Flower Realty would be happy to assist you. Call me, John Walker, at 361-449-2051 or send an email to DesertFlowerRealty(at)DesertFlowerRealty(dotted)com.